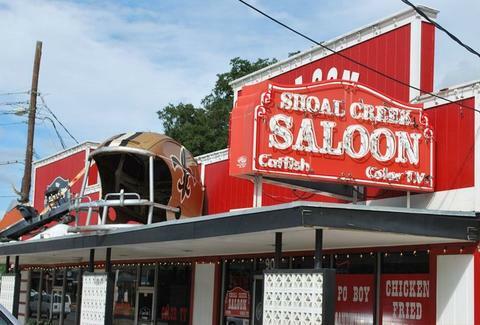 Where those Saints Go Marching: Shoal Creek Saloon 909 N Lamar; Downtown; 512.474.0805 A Clarksville mainstay for nearly 20 years, Shoal's Who Dat legions were so passionate about their Saints they inspired the owner to hire a Cajun chef to pump out gumbo, boudin, crawfish etoufee, and a Sunday special of red beans and rice, as well as sling bottled Abita Amber, Satsuma, and Root Beer -- because no matter what team you like, you can always cheer for beer. Yay! Catfish! Color TV! What else could you possibly want? Where the Vikings Pillage: Warehouse Saloon and Billiards 509 E Ben White; South Austin; 512.443.8799 For over 10 years, the brutalized Minnesota fan base has had the run of Warehouse's sweet A/V set-up, including 23 flat-screens, twin 10ft projectors, and hard-to-obtain commercial-free stadium feeds boasting actual field-sound -- nothing pumps you up for the playoffs like Brad Childress asking "How many times can Visanthe forget there's a camera in the locker room?" This could be the year. And even if it's not, you know you can't take your eyes off the Shiancoe. Where the Steelers Work Really Really Hard: Bikini's Bar & Grill Various Locations The Bikini's mini-empire is endorsed by the Steel City Mafia and the Pittsburgh "Meet Up" Group as the undisputed North-Sider hangout, with Steelers music before/during/after, tons of Iron-City decor, and specialty menu items like the Pitts-Burger (topped with fries, cole slaw, tomatoes, cheddar, 1000 Island) and the Steel City Bratwurst, clearly dressed with Terry Brad-slaw. And Mean Joe Greenes. And...Jack Ham. Are the waitresses hot? You Jerome Bet they is.